Stack six sheets of tissue paper. Make 1-inch-wide accordion folds, creasing with each fold. Fold a 12-in piece of floral wire in half and slip over the center of the folded tissue. Trim the ends of the tissue into rounded half-moons. Separate the layers of tissue paper, pulling each one apart and spreading them. 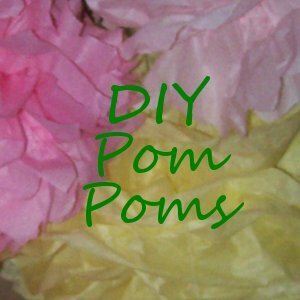 Take ribbon or fishing wire and loop it through the floral wire to hang the tissue pom poms. The shape of the ends of the tissue paper; instead of rounded ends, you could cut pointy ends. 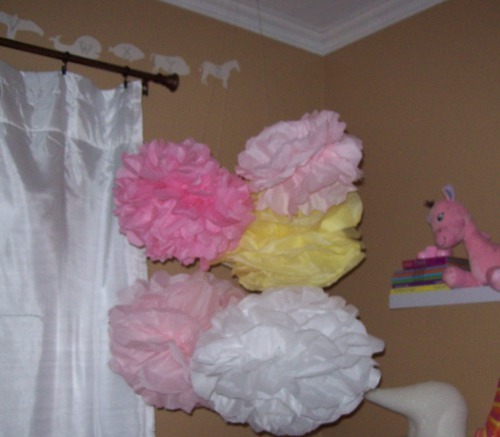 The size of the tissue paper to make smaller or larger pom poms. The size of the accordion folds to make more or less intricate creases. Here is how they look in the corner of the nursery. I love them!